Click the button below to add the FULL MOTION ARTICULATING TV WALL MOUNT FOR FLAT SCREEN TVS 13-27" to your wish list. 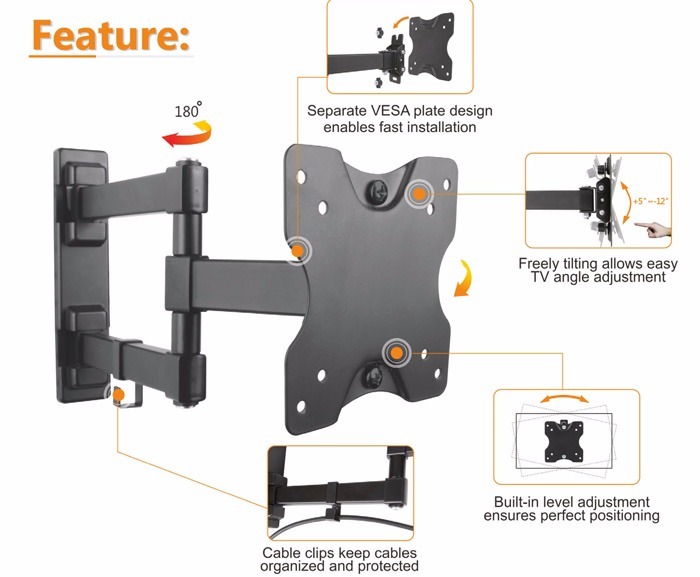 This full-motion wall mount fits most 13''-27'' LED, LCD flat panel TVs up to 15kg/33lbs. It allows smooth, effortless tilt motion that makes it easy to reduce glare and find the perfect TV angle at any height. Full motion allows maximum flexibility — extend, tilt and swivel your TV up to 350mm from the wall in every direction for easy viewing from any seat in a room. This pre-assembled arm comes complete with cable clips and decorative covers to ensure an elegant and tidy look. Its built-in level adjustment offers 3° clockwise and counterclockwise turning to ensure it is perfectly level. Compatible with VESA hole up to 100x100. FITS MOST SCREEN SIZES 13" - 27"